There are some of us that really love our Fall issue magazines. We keep them and drag them back out each year to study and savor; taking mental note on ideas that we each year translate into our own homes. My Autumn publication stack just keeps getting bigger and bigger, and each year my favorite story and photo shoot will always be their outdoor Fall tablescapes and parties. So for the last two years I've gone all out and created an outdoors tablescape and setting that celebrates the season with a vintage party feel. Departing from the party atmosphere of the last two years, I wanted a simple and quiet getaway by using all white, and neutrals, then letting the subtle beauty of nature complete the moment. Pumpkins, falling leaves, and bittersweet share the setting. I always enjoy this secluded spot on our patio, under a very large Japanese Maple. My old iron bistro set became my stage for a quiet outdoors afternoon of enjoying the crisp air, beautiful leaves, and the company of a few squirrels and birds. I wanted an elegant touch, so two of my Heisey goblets were chosen for their intricate lace pattern and delicate look. A chilled bottle of my favorite Riesling waits to be poured. 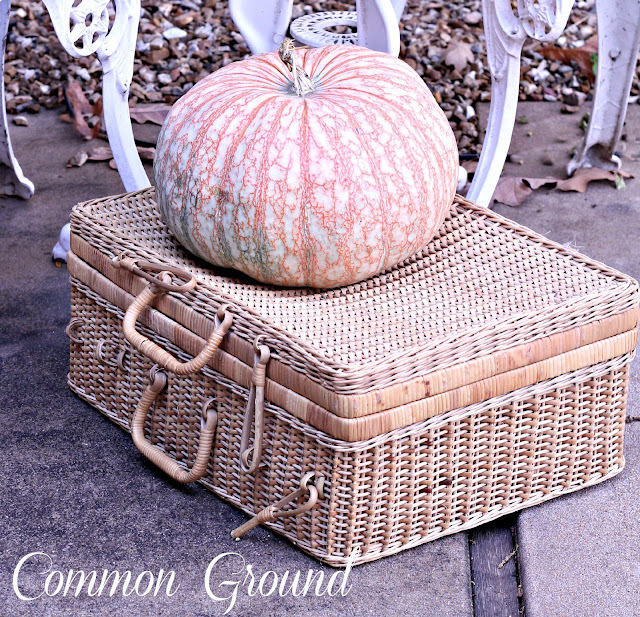 A vintage wicker lunch hamper with a happy fat pumpkin. On our recent trip to St. Louis I found this wonderful large ironstone soup tureen from England. Filled with a hearty stew, and with a loaf of crusty French bread, it's the perfect late afternoon supper. The sun started to peek thru the clouds, but the chilly wind let me know that November is just around the corner. some bittersweet and a white pumpkin complete the table. I'm so glad you came by to visit. I love this, Debra...so pretty and inviting. 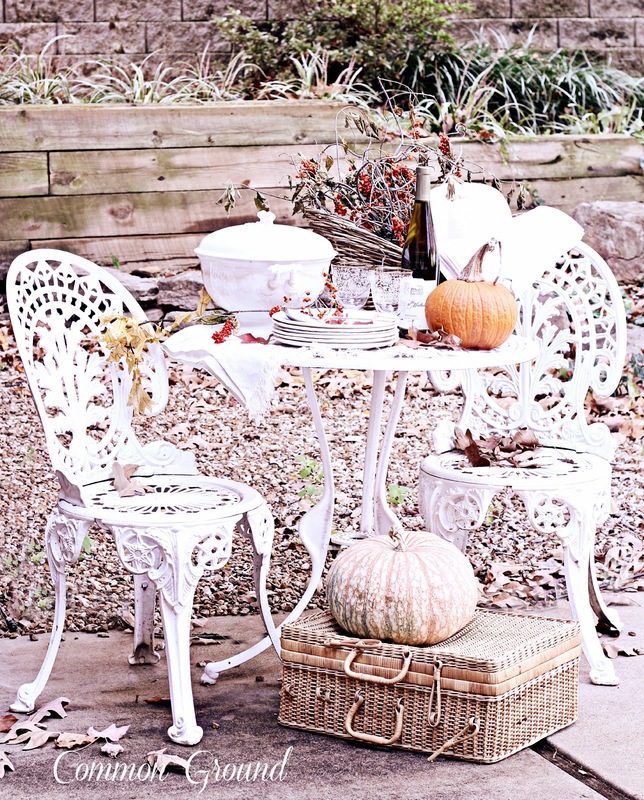 I can just imagine a perfect fall afternoon here! The pumpkin on your wicker hamper is unusual, I love it! Pop open that wine, I'm coming for a visit! 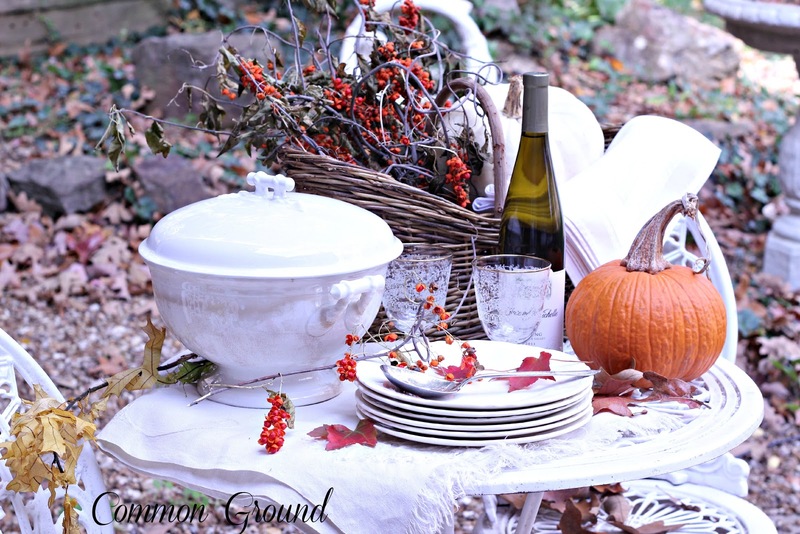 Such a beautiful setting and a beautiful tablescape, Debra! 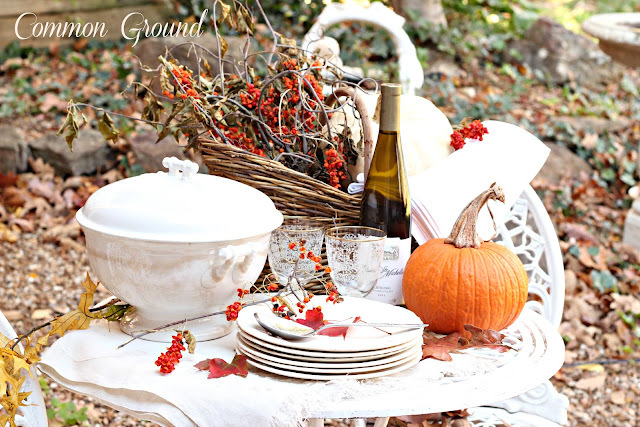 I love your tureen and the bittersweet just adds the perfect Fall touch to your whites. I could just imagine some beef stew and wine being enjoyed. Such an inviting area. Thanks for sharing with us. Love, love your tureen! Delightful table en plein air. I agree such a happy pumpkin. I enjoyed your tablescape and am tasting that delicious stew, bread and chilled glass of Chateau Ste Michelle. 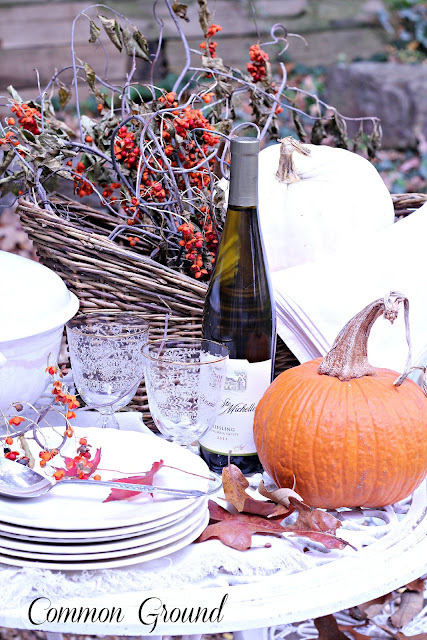 Now, I am off to tour the last two years fall tablescapes again. Thanks. 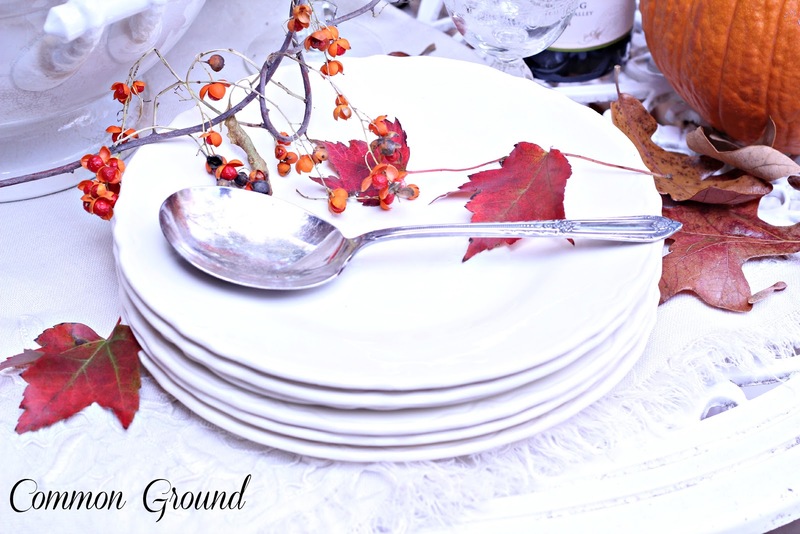 Debra - What a elegant and serene tablescape! What a wonderful way to spend an afternoon!! 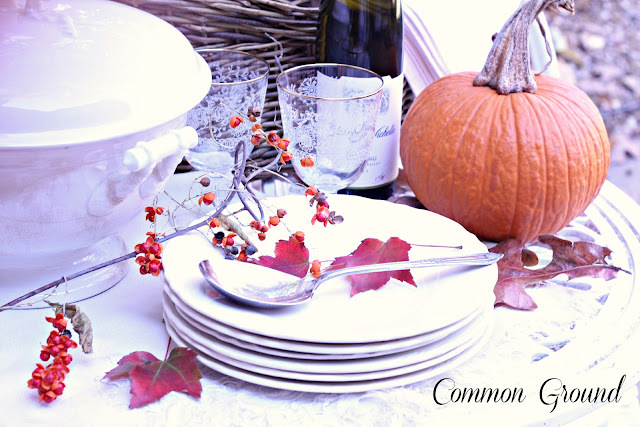 Your tureen is so pretty and the setting is just gorgeous - love your Heisey glasses!! It all looks so pretty Debra! I love the way you've set everything up. Well done! Ahhhh so beautiful. I want to join you for a glass of wine and take in that beauty. I love fall and the crisp air and all the pretty fall colors. This was a beautiful post. Thank you for sharing. Debra, this is such a pretty setting. I love your table and chairs. Great shots. this is such a beautiful post! I was born in the fall, married in the fall and my oldest daughter was born in the fall~it is my favorite season. 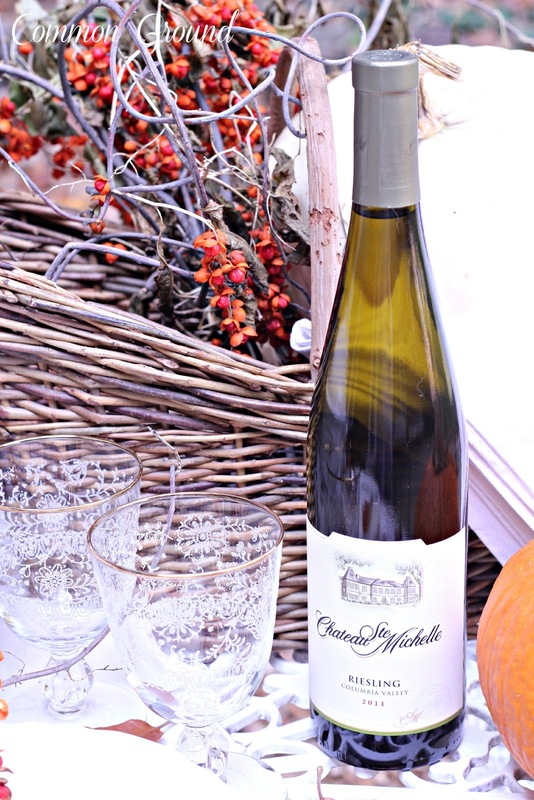 you have so many great ideas,wish I could join you for a glass of Riesling! the glasses are beautiful! Debra, what a beautiful fall setting! It looks so peaceful and serene. 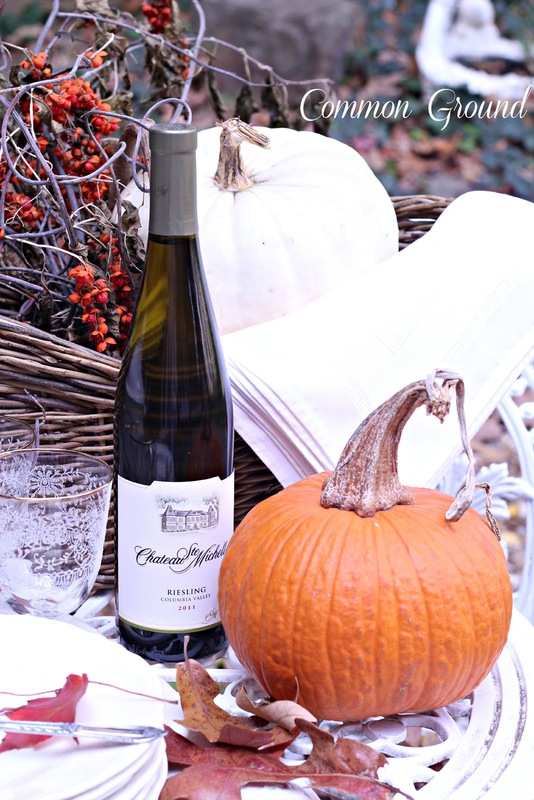 Perfect for a fall afternoon! Everything looks great 0 love the white with the bittersweet! I save all fall and Christmas mags - not the spring and summer ones. The ones that I keep just make me feel cozy! Just lovely. Your etched goblets are beautiful. Such a lovely little tablescape! I love the richness and warmth of fall colors! What a beautiful setting, Debra. I love the tureen and bittersweet is one of my fall favorites. Picture perfect. I can just see my big ol' melon head joining your pumpkins. This is so lovely and inviting! It reminds me - my sweet daughter never wanted me to rake leaves. She loved the look of fall leaves on the ground. They look great in your setting, too. Lovely setting. 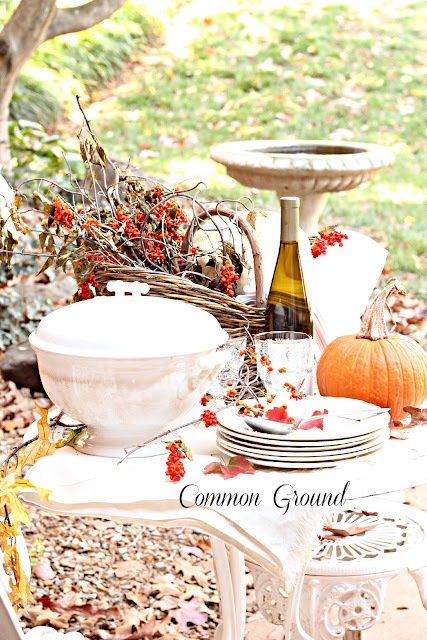 I love the neutrals with the fall colors! Such a beautiful setting Debra that you have shared with us. 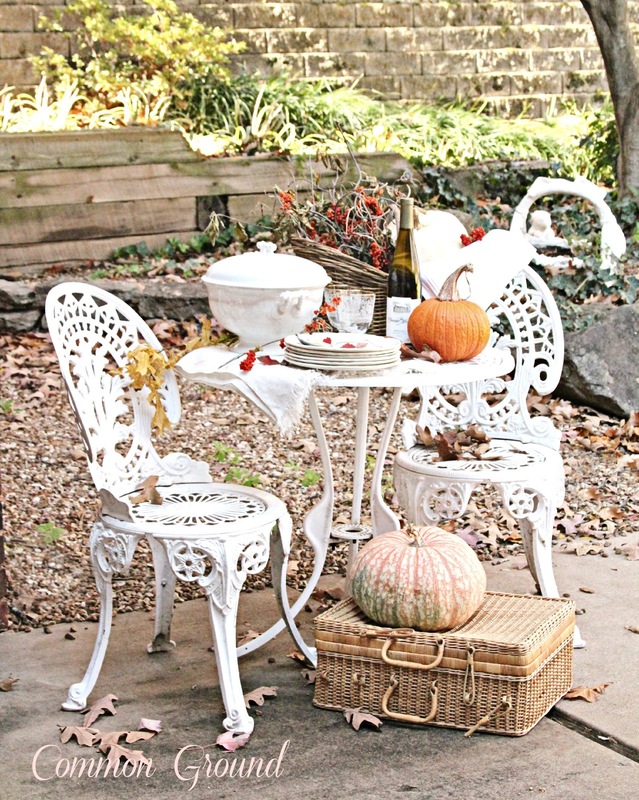 Love your white bistro set with us. Now I am wishing I wouldn't have gotten rid of mine and simply painted it like yours. The tureen is perfect for stew. Wow, it is all just so impressive, wish I was sitting there enjoying the table and the afternoon. The neutral palette does set off your Fall accessories, dear friend! Lovin' that soup tureen! Unfortunately for me, everytime I'm out~of~doors...my sinsus go NUTS!!! Thanks for letting me join you via virtual tour! I have to say that these are some of the most gorgeous outdoor photos I have seen. I love this entire setting. So beautiful and so inviting!! What you set up should be in a magazine!! 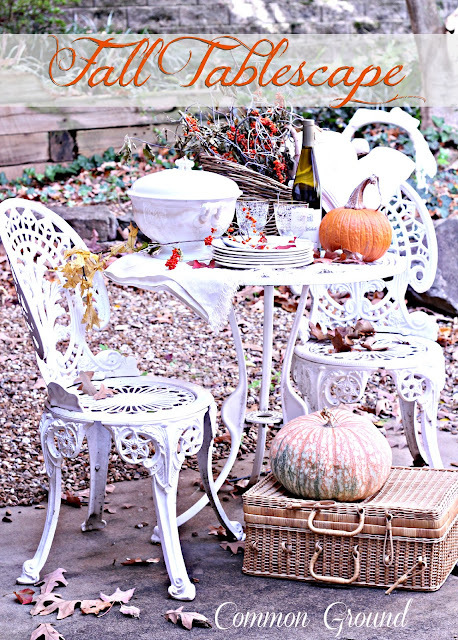 What a romantic fall scene Debra! Love that little bistro set. I have that same exact wicker suitcase thing! I would love to be invited to a fall party that has as gorgeous a table setting as yours, Debra--I love all the white, and the lunch hamper and the happy fat pumpkin! 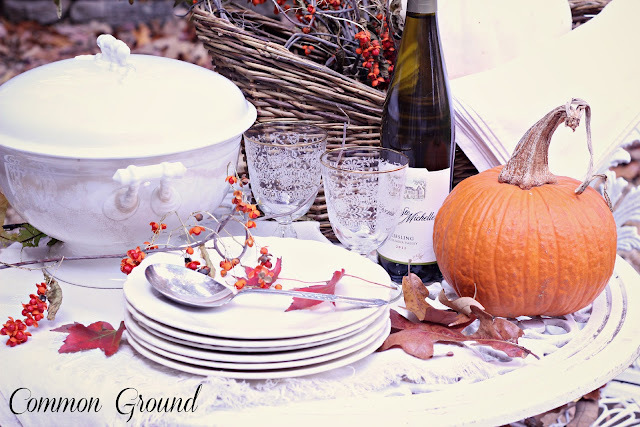 I love your fall tablescape. You have created such a welcoming arrangement with the perfect blend of rustic and elegant. 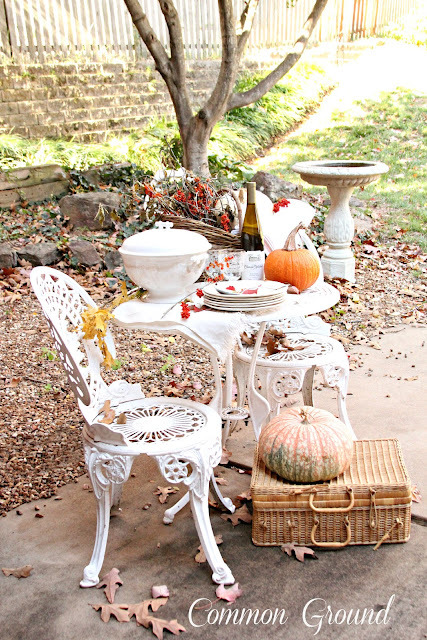 Love your outdoor vignette. So charming and inviting. Love the soup tureen. 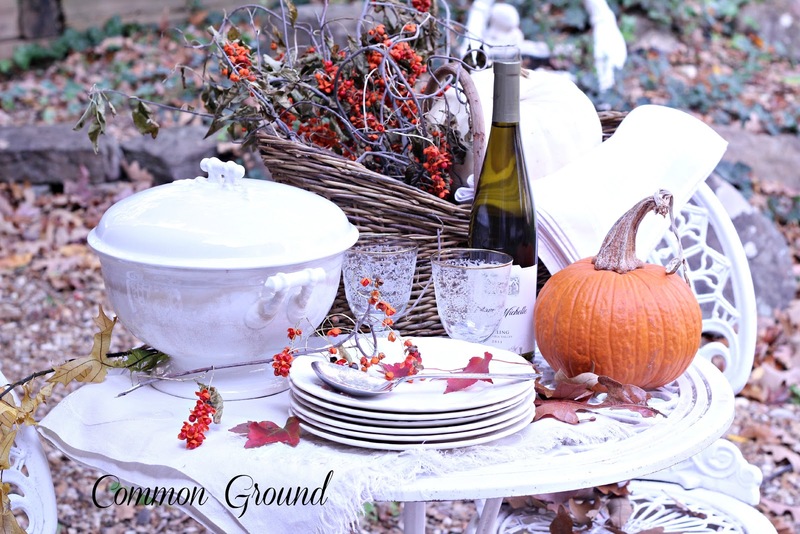 A setting perfect for a special fall day. I have a stack of fall magazines too that keep growing each year. Yep, we all have those that we keep and look at year after year. Your table setting is beautiful. Magazine worthy. I hope your day is going well and thanx for coming to THT! Gorgeous...simply gorgeous. Each and every detail is delightful. You captured the essence of Fall and alfresco dining wonderfully! Looks like it's from the pages of a magazine, Debra! Thanks so much for all of the inspiration you give us! LOVELY, Lovely, Lovely!! So picturesque. And thank you, Debra, for hosting VIF each week. 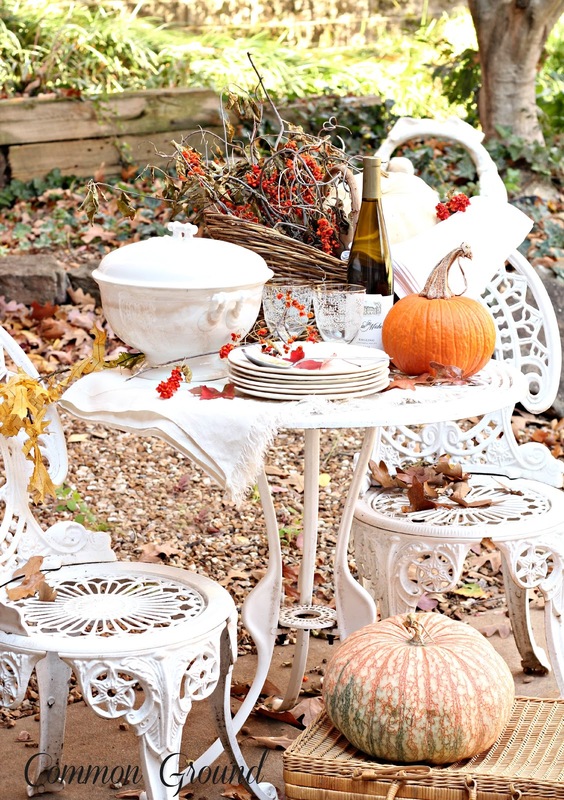 Debra, I love this outdoor fall table setting. So beautiful! Thanks for sharing on Simple & Sweet Fridays. So beautiful Debra!! Just love it! Thanks for linking up!! This is so very beautiful Debra! I am especially loving that soup tureen!! What a great find. Thanks for joining Home Sweet Home!